MEETIC (MEET – FR0004063097), the European leader in online dating, today announces its consolidated and audited results for the financial year to 31st December 2010, approved by the Board during its meeting of 15th March 2011. 2010 consolidated annual revenue came to €186.0m, up +17.8% compared to 2009. Internet subscription sales (billings excluding deferred revenue) totalled €183.6m over the year, an increase of +19.8% on 2009. Boosted by the growth in Matchmaking, activity was particularly buoyant over the second half of the year. Hence, in 2010, the Group acquired an additional 40,000 subscribers on the Matchmaking segment, taking the total to almost 140,000 at the end of 2010. Matchmaking contributed close to €34.0m to total Group revenue in 2010, an increase of +34% compared to 2009. The Group thus had a total of 858,197 subscribers at 31st December 2010. Earnings Before Interest, Taxes, Depreciation and Amortisation (EBITDA), and after the cost of free shares, totalled €38.3m in 2010, up 2.6% compared to 2009, giving an EBITDA margin of 20.6%, within the guidance bracket reaffirmed throughout the year. Marketing investments were limited to €15.5m over the 4th quarter of 2010, i.e. 32.2% of revenue. Over the final quarter of the year, the Group thus prioritised profitability, with an EBITDA margin of 40.3% over this quarter, again showing its ability to manage its operating profitability. Marketing investments for the year as a whole totalled €94.8m, or 51.0% of 2010 annual revenue. Personnel expenses (including a non-cash expense of €2.9m associated with valuation of free share plans) came to €27.9m, or 15.0% of 2010 revenue, versus 16.9% in 2009. The Group’s workforce increased from 386 to 398 in 2010. The divestment of the ParPerfeito Brazilian subsidiary, which was contributed to the Joint Venture created with Match.com for the development of the Group’s activities in Latin America, generated a profit of €2.3m. The Group’s net profit consisted of net profit from continuing operations, which totalled €21.9m, Group share in net profit of the Latin American Joint Venture, which came to €1.0m, and net profit from discontinued operations, which totalled €2.3m. The Group’s net profit thus totalled €24.2m, an increase of +23.0% on the 2009 figure. The Group has a business model that generates positive operating cash flow thanks to its subscriber model and its profitability. Net cash flow from operating activities thus totalled €29.7m over the financial year. In 2010, net cash flow from investing activities totalled -€35.6m, essentially related to the June 2010 payment of a dividend of 1.50 euros per share giving a total dividend of €34.2m. 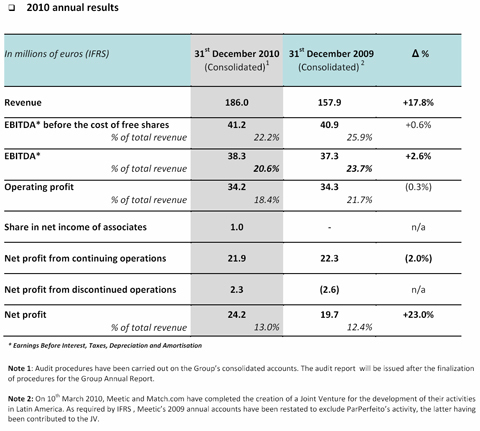 At 31st December 2010, the Group had a net cash surplus of €40.6m and no debt. Meetic have now launched Smartphone Applications in France and Spain. By the end of the year Meetic will deploy its mobile applications for its Dating brands across Europe in order to benefit from the substantial growth in the number of Smartphones in European countries in which the Group is present – France has 7 million Smartphone users (comScore, March 2010) for example, or 48% more than a year ago. The major challenge for the Group is to increase the time users spend on its services, which will gradually enable it to increase uses, interactions and therefore efficiency of service for its users. Following months of development, the mobilisation of some hundred people on this project and all of the Group’s know-how, in the summer Meetic will launch a new-generation platform for its Dating sites. The new Platform will be more user friendly, integrating new features borrowed from social networks and Smartphones. This combined with new Matching algorithms will allow Meetic to move ahead of its rivals. In particular, this new-generation platform will, just like the main social platforms, host third-party applications. These Apps will allow users to import and integrate into their profile their tastes in terms of music, films and literature, their adherence to various communities and other information related to their social network usage. This wealth of information will thus allow Meetic to further improve the way it puts users in contact with each other through a new Social Matching algorithm. In accordance with the values that the Group has always conveyed and defended, Meetic will further strengthen its systems to ensure an ever more optimal quality of service, notably through the setting up of new monitoring technological solutions and the opening of a 24/7 telephone helpline for its customers. These distinctive new brands and new offers will benefit from the Meetic Group’s leadership, all of its moderating, security and technological know-how and its distribution ability resulting from the substantial traffic it already records across all of its European sites.